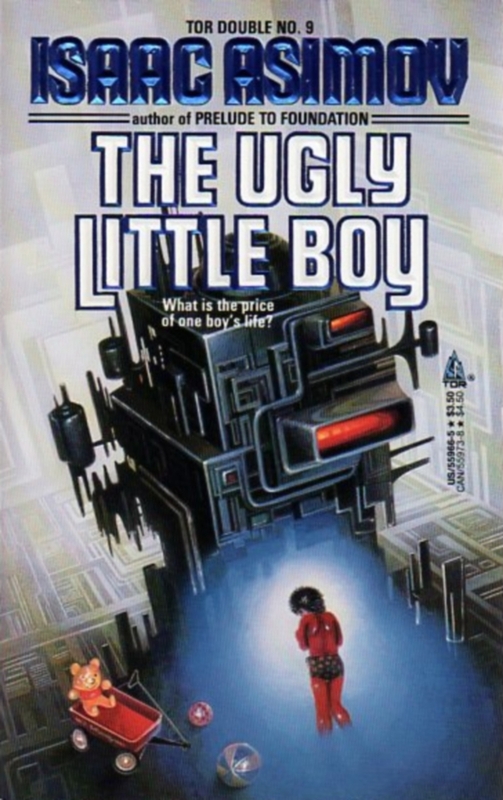 Perhaps Isaac Asimov’s most famous novella, certainly one of his best, Lastborn (aka The Ugly Little Boy) is in the public domain and narrated by the wonderful Gregg Margarite! so for having died so many centuries ago! 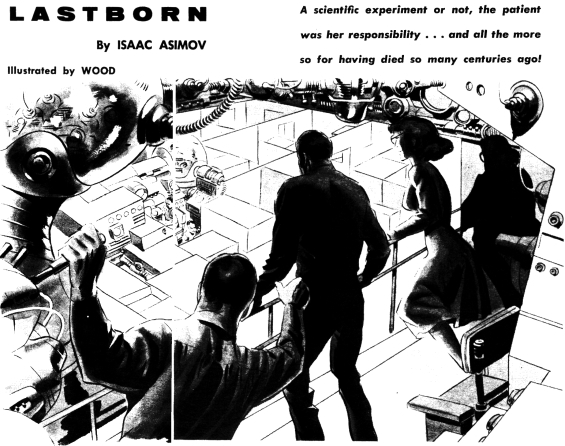 First published in the September 1958 issue of Galaxy Science Fiction. That entire issue, including Lastborn, is available as a |PDF|. 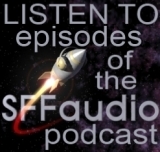 The SFFaudio Podcast #041 – Jesse and Scott are joined by SF author Robert J. Sawyer to talk about his audiobooks, writing Science Fiction novels, and the TV show based on his novel FlashForward. FlashForward (the TV series), FlashForward by Robert J. Sawyer, Blackstone Audio, David S. Goyer, Marc Guggenheim, Jessika Borsiczky, Brannon Braga, Lost, Battlestar Galactica, does the TV show of FlashForward have a plan?, idea based SF, time travel, The Time Machine by H.G. Wells |READ OUR REVIEW|, differences between the television show and the novel versions of FlashForward, WWW: Wake by Robert J. Sawyer |READ OUR REVIEW|, Inconstant Moon by Larry Niven, philosophy in Science Fiction, Calculating God by Robert J. Sawyer |READ OUR REVIEW|, Jonathan Davis, Audible Frontiers, atheism and religion in SF, scientific institutions in Science Fiction, The Royal Ontario Museum, CERN, The Sudbury Neutrino Observatory, science, Robin Cook, Michael Crichton, Launchpad Astronomy Workshop, Edward M. Lerner, Joe Haldeman, science literacy amongst Science Fiction authors, Karl Schroeder, Charles Stross, post-singularity SF, Clarke’s Third Law, NASA Ames Research Center, TRIUMF, Human Genome Project, Neanderthal Genome Project, military SF, S.M. Stirling, Harry Turtledove, alternate history, consciousness, aliens, spaceship, time travel, the WWW trilogy, Audible.com, Starplex by Robert J. Sawyer, Star Trek, alien aliens, Larry Niven, Niven’s aliens, Golden Fleece by Robert J. Sawyer, how did fantasy and Science Fiction get lumped together? Donald A. Wollheim, dinosaurs, artificial intelligence, genetics, time travel, the Internet, quantum physics, CBC Radio’s version of Rollback, Alessandro Juliani. He swayed back against the recoil and worked the bolt with a quick flick of his first three fingers. A body exploded out of the patch of tall grass he’d aimed at. It was a biped, about his own size and covered in yellow-green feathers except for a crest of crimson plumes that snapped out in reflex as the lizard body writhed in death. The jump put it a good twelve feet into the air; a good deal of its length was the powerful digitigrade legs, both with a great sickle-shaped claw held up against the hock. That flashed out in equally automatic reflex as the vicious predator struck out in one last attempt to disembowel whatever had hurt it. A steam-engine hiss escaped the long fanged mouth, scarlet-purple within, and a spray of blood came with it from the lungs shredded by the powerful expanding bullet. “Raptor pack!” Marc shouted to the herdsman. 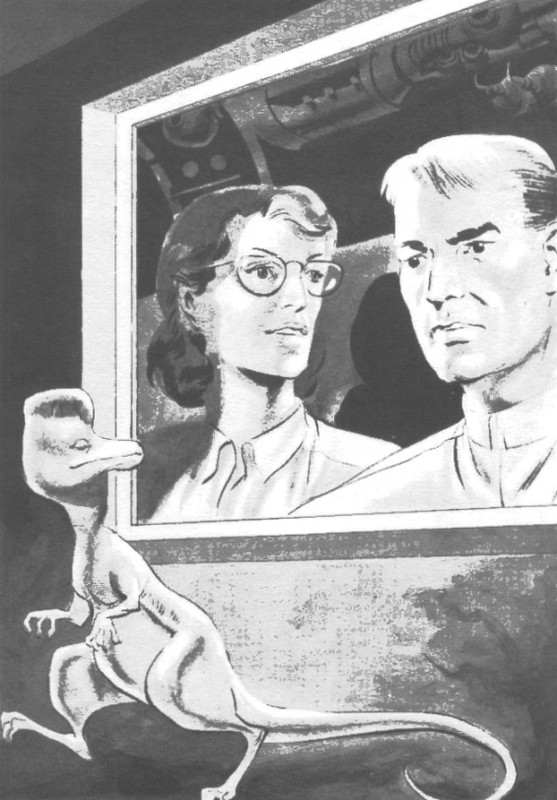 The Sky People fits into that alternate history sub-genre of SF but not in the usual way. Generally, alternate history tales follow the events of the real world with one event changed in the past that creates a different outcome and changes history from that point forward. This may be the South winning the Civil War or Mary, Queen of Scots, becoming the Queen of England. The departing point for this novel took place approximately 200 million years ago. But it didn’t occur so much on our own planet but on Venus and Mars. This means this alternate Earth’s history doesn’t change until the U.S. and Soviet Union start exploring interplanetary space. The prologue features the landing of an American rocket ship on Venus in 1962. The planet’s surface appears as a lush jungle – then running into view of the film camera is an exotic and beautiful scantily fur-clad female with her clan’s people. The novel proper then begins 22 years later in 1988. The Cold War has changed from an arms race into a competitive interplanetary space race to explore and stake their claims on Venus and Mars. Marc Vitrac, a citizen of Jamestown, the U.S.-Commonwealth scientific colony, welcomes the newly arrived rocket passengers. Their mode of transportation from the landing site to Jamestown is on the back of dinosaurs through the jungle lushness of Venus. Meanwhile, on the nearby Venusian continent, the Soviet bloc has set up their own scientific outpost. When one of their shuttle crash lands in the relative vicinity of Jamestown, a rescue party is put together to search for survivors. They travel via airship, and it does not fair well against the natural hostile environment. What’s more, there is a saboteur among the blimp’s crew. The story grows more intriguing as Marc Vitrac and the stranded party of the airship meet with a clan of primitive humans. The two parties join forces to face off against a tribe of armed Neanderthals! As you might imagine, this novel reads as a love letter to the early pulp master, Edgar Rice Burroughs. But it’s no mere pastiche of the creator of Tarzan, John Carter of Mars, and most pertinently, Carson of Venus. Stirling uses hard science justifications for his world building. And there’s also more of an emphasis on cultural diversity that you’d expect from a novel written in the 21st century. Sterling is a capable writer, whether it is a turning of a phrase or a description of lush imagery, he’s able to handle it all without getting too far from the gloriously pulpy action. Burroughs is often mentioned in the book as being a major influence on the many of the denizens of the scientific colony. What exactly happened those 200 million years ago isn’t exactly clear. Why is the planet’s evolution so closely tied to that of Earth’s? The reigning hypothesis in The Sky People is that aliens seeded the planets nearest Earth. There are mysteries here that are to be answered over the length of the trilogy. Todd McLaren handles the dialects deftly without overemphasizing the accents. Some novels are well-suited to be adapted to audiobook, as if they were written for that treatment. The Sky People is one of these, it makes an ideal audiobook. The large ranch of characters with multi-cultural backgrounds enables Todd McLaren to apply his talent for dialect and keeping the listening experience fresh and varied. Sterling also writes with sounds effects—meaning, he literally writes “Unnnngg-OOOK!” for a bellowing dinosaur, so it’s like the story has the sound effects built in, which McLaren gets to vocalize. The Sky People is a rare pleasure—well-written, thrill-ride excitement, fun characters, lush settings, and all wrapped-up in a wonderful vocal performance. This is the first novel in a projected trilogy. I sincerely hope that Tantor Audio, with the talents of Todd McLaren, publishes the complete series. In the year A.D. 922, Ibn Fadlan, a devout Muslim nobleman, left his home in Baghdad on a mission to the King of the Bulgars. During his journey, he met various groups of “barbarians” who he reported as having varying degrees of bad hygiene and alcoholism. It was a classic clash of cultures story that revealed more about both societies than any other type of narrative could. Whilst encamped in a Norseman trading village word came of a request for warriors to return to Scandinavia to battle an unnamed foe. Because the Norsemen were so superstitious, Fadlan was shanghaied as the “13th warrior”, a necessary foreigner, and forced to accompany the war party. Under the leadership of Buliwyf, Fadlan and eleven other Norsemen journeyed far to the North, to a land where the nights last only a few minutes, where sea monsters abound in the oceans and where shimmering lights in the sky are a nightly occurrence. Once there he and his companions must fight a battle against the Eaters Of The Dead. If the premise is familiar it may be because you’ve seen the movie “The 13th Warrior,” which is based upon this novel. Supposedly this is a true story taken from the journals of an Arab courtier named Ahmad Ibn Fadlan. In reality it is only partially based on those writings. Crichton wrote Eaters Of The Dead based on a bet. He argued that Beowulf, the oldest surviving epic in British literature, could be successfully turned into a satisfying adventure story. In the real life writings of Ibn Fadlan Crichton found a viewpoint chracater who’d be able to witness the adventure of Beowulf and his fight against Grendel first hand. Starting with actual journal entries from Ibn Fadlan, Eaters Of The Dead begins as non-fiction. 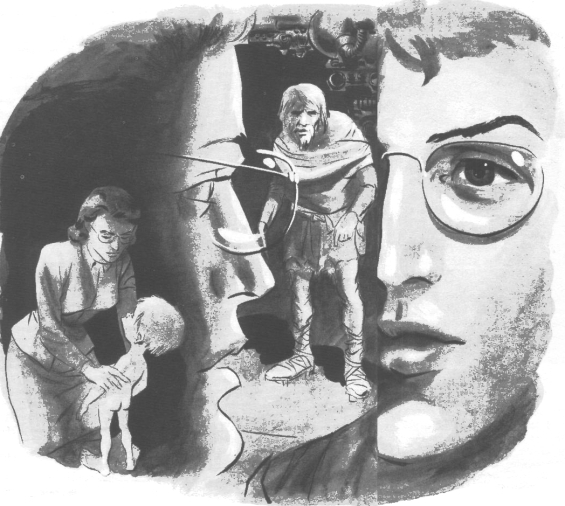 About a third of the way into the reading, Crichton stops using Fadlan’s journals, starts writing in the style of Fadlan, and begins telling his version of Beowulf. Sounds simple, but because Crichton doesn’t tell us any of this in his introduction, it isnt. Confusing things further, Victor Garber’s reading of the story is interupted every so often by commentary by Michael Crichton! Crichton doing commentary on Crichton confuses things to a high degree, and yet somehow it works! This is a compelling story, likely because it draws so heavily from the deeply rooted mythology including snippets of ideas from everything from J.R.R. Tolkien’s The Hobbit to modern anthropological theories regarding the extinction of the Neanderthals. Victor Garber does a good job reading, his only flaw is that his Arbaic accent sounds a bit to much like a Punjabi accent. Crichton too reads his commentaries well. As with many abridgments this one leaves the listener wanting more of the story, though thankfully it doesn’t suffer from the equally common failing of being incomprehensible. As with all Michael Crichton novels, this turns into a Frankestienian morality tale in the vein of “there are some things men wernt meant to know”. For the most part it works, but what bothers me most about Eaters Of The Dead is its fence sitting nature. Not strictly fiction nor strictly non-fiction, Crichton has chosen to deliberately blend the reality and the fantasy without any disclaimer of even the most generous “based on a true story” or even the weaker “inspired by true events”. Instead he deliberately tricks us into thinking this is a true story by interspersing his own commentaries about the translation! True stories are inherently more interesting than fiction, no doubt Crichton chose to capitalize on this by deliberately obscuring the fact that he basically made up the whole last 2/3rds of the book! Had there been a disclaimer about this at the beginning of the book I’d have been much happier with it. That said, the story is fun, an interesting ride, and certainly one of Crichton’s best novels, but it isn’t even in the same class as say Robert Silverberg’s terrific A Hero Of The Empire, which also deals with historical figures in ancient Arabia.. If you absolutely insist on reading Michael Crichton novels I’d recommend you actually NOT read his Science Fiction! Read his fantasy, read Eaters of The Dead and then if you want a non-SFF treat try Crichton’s admirable The Great Train Robbery (also based on a true story), which is far better than his constant rehashing of Frankensteinian plots about cloning, time travel, etc.